Doors Open Toronto this Weekend! ~ The Toronto Hare Krishna Temple! Doors Open Toronto this Weekend! 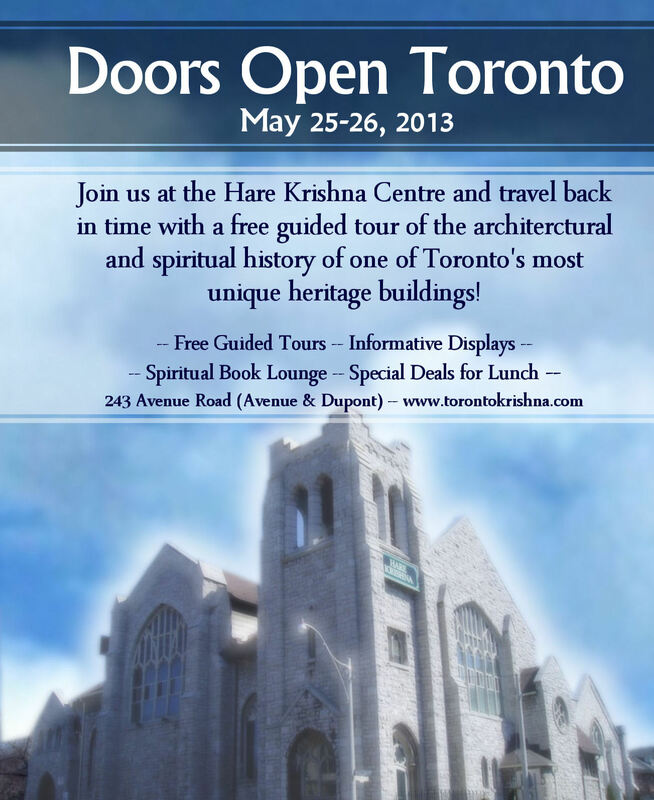 This weekend (May 25 - 26), the Hare Krishna Centre is participating In Doors Open Toronto. Annually, 150 buildings of architectural, historic, cultural and social significance open their doors to the public for a city-wide celebration. 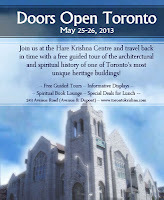 While Toronto's Hare Krishna Temple is open, free of charge, to the public year-round, Doors Open presents an opportunity for the public to learn about the architectural and historical story of our amazing building! Guided Tours will take place from 10am-5pm on Saturday May 25th and Sunday May 26th. Guided tours of the building highlight the architectural, historical and spiritual history of the building. There are also visual displays of media news clippings and interesting publications related to the building. There will also be a book lounge and free refreshments provided to the visiting public! Additionally, the regular Sunday programme (Sunday Feast) is open to the public 6:00-8:30pm, including a Free Vegetarian feast served at 7:30pm. For more information, please visit the official Doors Open website here.